Make sure the tilt rod is not bent and has not slid out of the tilter mechanism. The tilt rod should be about 1 ½” smaller than the headrail size to ensure that it can turn. The rod should also not be blocked from turning by the end stiffeners or center lock. Ensure the tilter mechanism is secure in the headrail. Make sure that the tape roll is centered in the tape roll support so it can rotate freely. 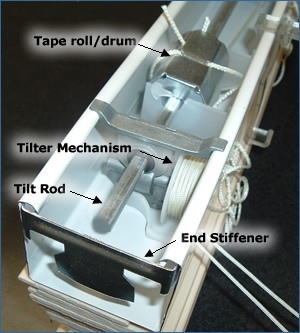 The tilt rod should be free to turn without tension with proper placement of the tape roll support. The rod should not bend to fit into the tiler gear or the tape roll supports. Spray the headrail parts (including the tilter and tape rolls) with a silicon spray to fix any abnormal stiffness or squeaking. If the previous methods have failed, or it is clear that the gear in the tilter is worn out or broken, it may be necessary to replace the tilter.